This beef curry recipe is not a dish which you will find very often on the Indian mainland. Sri Lanka (formally known as Ceylon), however is largely Buddhist and, while a great many Buddhists are vegetarian, in Sri Lanka you will find all kinds of meats are eaten so this kind of dish would not be uncommon. Sri Lanka also eat some of the spiciest food in the world, hotter even than Southern India. This beef curry recipe is a toned down version of the traditional Ceylonese dish, which would be unreasonably hot to Western tastes. I have used this beef curry recipe many times, it is like a really good spicy beef stew with lots of spice and lots of interesting flavours. It's one of those dishes that you can play about with quite a bit by adding extra spices and vegetables. 1 lb (450gm) diced beef. ¾ inch (2cm) root ginger. ¼ pint (5fl oz) coconut milk. 2 fresh green or red chillies. ½ teaspoon grated or powdered nutmeg. Seeds from 6 cardamom pods. Meat. This is quite a big dish, the quantities given will easily feed four people when just eaten with rice (but it will keep in the fridge for a few days). 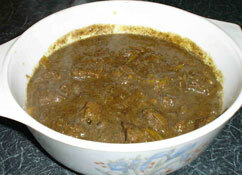 Although this is a beef curry you can use lamb or mutton instead if you like. I usually buy stewing steak or skirt and trim and dice it myself. Onion. If you have them, it is good to use 3 or 4 of the small silverskin onions as they are a little sharper, but normal onion will do. Lime. You can use lemon instead or you can use tamarind soaked and pulped. Coconut milk. This is quite easy to buy now but you can make it by adding about ½ pint boiling water to about ½ lb of desiccated coconut, leaving for about 30 minutes and straining the liquid off through a sieve. Chilli. Depending on the strength of the chilli's you are using and how hot you want this. Two medium strength chilli's together with the pepper will make this reasonably hot. Bell pepper. Optional I like the colour and it adds another flavour. Spices. This is meant to be a highly spiced dish; not just hot but with strong coriander and other spice tastes. You can adjust the quantities; I had a comment on this recipe that there was too much pepper - the first recipe I ever saw for this suggested 3oz (80gm) of it! This I would not recommend, but each to his own. Oil. Traditionally most beef curry recipes from this region would probably be cooked in coconut oil. This is not the easiest thing to find and is not to everyone's taste. I have also used mustard oil and ghee. Good vegetable oil is acceptable. Heat up a dry frying pan and throw in the coriander, cumin, peppercorns, and cloves. Heat until the coriander seeds just start to change colour. Grind these spices together with the seeds from the cardamom pods. Mix the spices with a little water or vinegar to form a paste. Finely chop the fresh chillies. Peel the ginger root and cut into tiny dice. Cut up the celery into small pieces. Cut the bell pepper into strips and halve each strip. Quarter the lime, remove the flesh and cut into small pieces. Put in onions, garlic, celery and root ginger, and fry until the onions are soft. Put in the turmeric and fresh chillies and fry for a couple more minutes. Put in the spice paste and fry some more stirring all the time. Put in the meat and fry till brown on all sides. Add the flesh from the lime (lemon or tamarind pulp). If you get all the vegetables and spices nicely prepared (mise en place as a chef would say in a suitably French accent), then this beef curry recipe is quite an easy one to do. Make sure the meat is properly browned before adding the liquid - the spice can sometimes give a false impression. You can cook this for quite a while on a low heat as long as you check that it does not dry out too much (just add a drop of water if necessary). It will start off looking quite soupy and thicken up as you cook it. Serve with plain boiled rice and a pickle and/or chutney of your choice, and maybe a simple lentil dish or a simple potato dish. I like this with mango chutney plain rice and aloo bhaji. This quantities here should feed 4 adults with side dishes.